TotalGrow light fixtures use a revolutionary new Solid State Volumetric Lighting (SSVL) Technology to produce a custom tailored light spectrum that maximizes plant growth and health, with minimal energy consumption. This advanced technology solves many of the challenges facing other grow lighting technologies. The SSVL structure allows for unequaled mixing and uniform distribution of light in the exact wavelengths that plants need most for quick and healthy growth. A metal-clad printed circuit board with light emitting semiconductor chips produces high-brightness, short wavelength light. 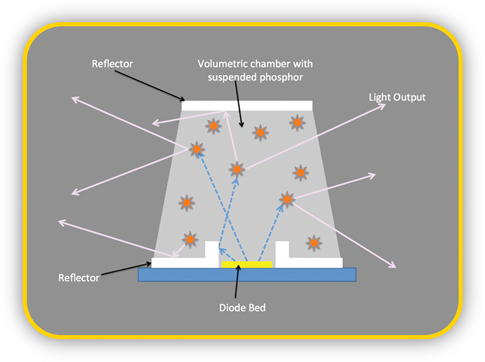 A top and bottom reflector reflects the light within a volumetric chamber with wavelength-tailoring phosphors suspended in an optical solid. Light passing through the volumetric chamber is down-converted into secondary wavelengths that are emitted through the sides of the volumetric chamber – causing the volume to glow like a filament bulb. 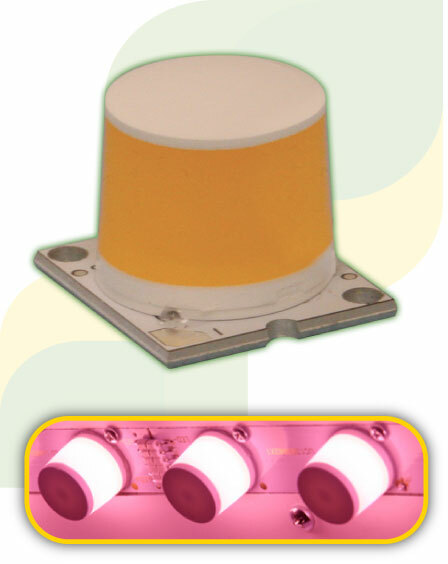 Matching the appropriate wavelengths of light emitted by the semiconductor chips and the phosphors allows the SSVL technology to be optimized for specific light color characteristics. The light emitted from the volume is incredibly uniform and shines in a pattern similar to an incandescent bulb without shadow points or hot-spots.